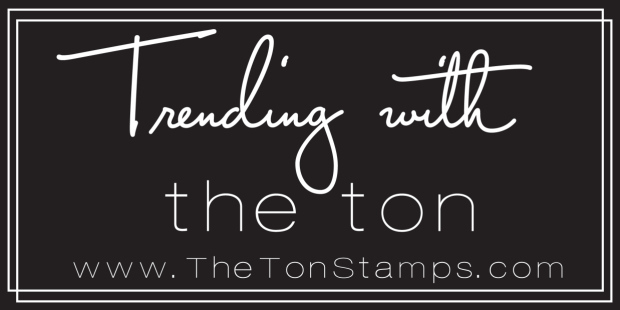 Welcome to the IOStamps 2017 Fall/Winter Die Release Blog Hop! 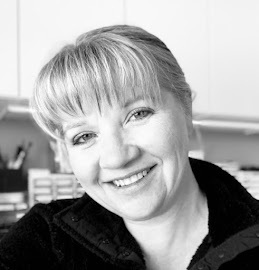 Visit the fabulous IO Design Team’s blogs (only one comment per blog per day please) for a chance to win one of FOUR $25 Gift Certificates! One winner will be chosen each day and then an extra winner will be chosen randomly from all hop days. All winners will be announced on September 18th. 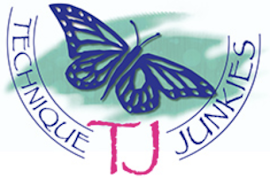 The more blogs you visit and comment on… the better chance you will have to win!!! These new dies are thin steel dies that cut paper, cardstock, cork, thin wood, or felt beautifully in your die cutting machines. They are fabulous. Click HERE to see the entire new release die collection. Today I have an ornament shaker card to share with you. This Floral Ornament die is absolutely stunning in it's detail and versatility. Today I have cut the die twice. Once in blue cardstock, and again centered horizontally in white. 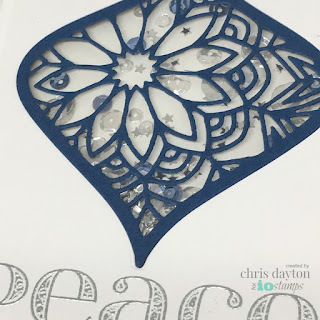 I removed the white die cut, and stamped the Peace greeting at the bottom of the panel with Versamark ink and embossed with silver embossing powder. I then adhered a piece of clear plastic to the back side of the white negative panel with Scor-tape. I then removed all the interior pieces from the blue ornament die cut and adhered it within the negative space of the front side of the white panel using Elmer's spray adhesive. I then prepared the shaker. I lined the back side of the white panel with two layer's of 3M foam tape, carefully sealing the area directly around ornament. Once fully completed, I added a mix of blue, clear and silver sequins within the foam tape area. I removed the paper backing from the foam tape, and sealed the sequins within the ornament area with a piece of white cardstock. I then adhered the shaker panel to an A2-sized side fold white card base. My next card also contains a Christmas ornament. I started this card by making three of the Pine Branch die cuts from Artistico cold press watercolor paper. I placed them on my craft mat and sprayed them with Crushed Olive and Mowed Lawn Ranger Distress spray stains. I removed the die cuts and set them aside to dry. I then spritzed the leftover overspray ink with water and used an A2 sized piece of Artistico watercolor paper to sop up the remaining ink. I spritzed the watercolor panel with more water, and let the water wash the majority of color to the top left corner, and dried it with my heat gun. I then stamped the Bird Ornament stamp on Hammermill Digital Color Cover 80# paper with Memento Tuxedo Black ink, and colored the ornament with Copic markers. When finished and dry, I handtrimmed the ornament with scissors. 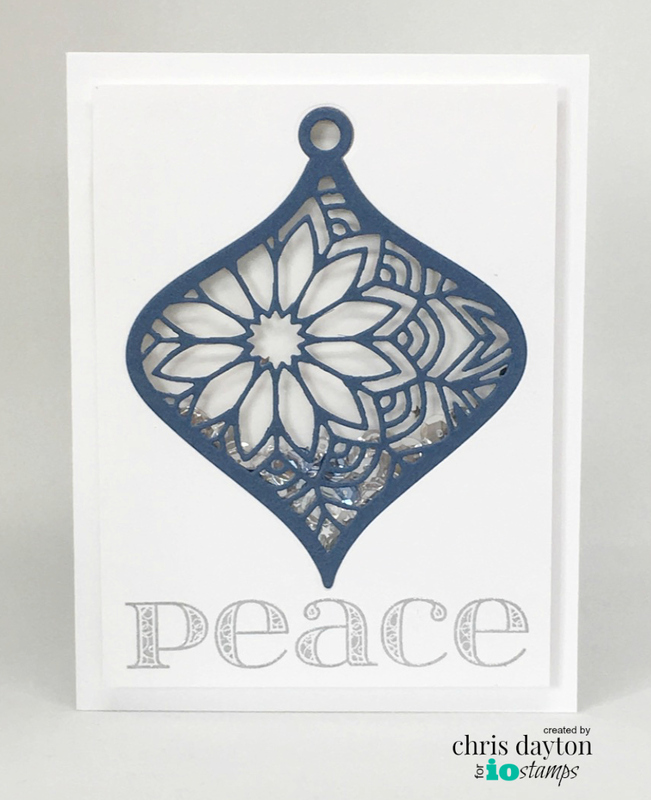 I stamped and heat embossed the Peace on Earth greeting from Season to Sparkle in silver, then assembled my card, allowing the Pine Branch die cuts to overlap each other as well as a small portion of my ornament. I then adhered the completed panel to a matching green side fold card base. Here the links for the rest of the team!! Gorgeous shaker cards! I absolutely love the ornament die cut in blue! Gorgeous ornament die, and the bird ornament is so sweet tucked in the branches! Wonderful cards, great way to make a shaker card using the die! Both of your cards are so peaceful looking with the colors chosen. I am more of a die girl than a stamper so my eye went toward the blue ornament on the first card and then to my favorite pine branches on your second card. I love how you arranged the branches off the edge of the paper. Your cards are very calming in nature and lovely to look at. Chris, love that first card. That die is amazing! TFS! Love the shaker card. Beautiful die! Great ideas. love the pine branches. Love that it is a shaker card. Great idea! Very nice sweet, simple cards. When time is short and so many cards R needed, quick is going to be my goal this year. Thanks! The shaker ornament is beautiful. the second card. So elegant. Beautiful ornament cards. Love that the first one is a shaker. Beautiful job !! I really like the idea to use the ornament die as a shaker window. I especially love the pine branch dies, so versatile! Two wonderful cards, my favo is the shaker one. Really pretty cards. Shaker card pretty good idea. I like dove one too. Beautiful ornament cards! I love the serenity of the blue ornament with the blue, silver and clear sequins making it a shaker card! The second card is also peaceful looking with the beautiful coloring of the bird. Making that ornament peek out of branch die cuts was a great idea! Gorgeous ornaments. Love the shaker card. I love that ornament die! So elegant! Love both cards. Great job! My favorite of your two cards is the bird and how wonderfully you used the watercolor to blend the entire card together. Both cards are wonderful and I love the fun shaker element with the die cut ornament. Festive and fun! Beautiful cards! 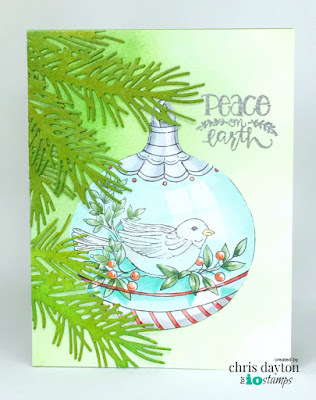 Love the way you colored the bird ornament, and the pretty ornament die you made a shaker card with! Beautiful cards! I love the ornament and how you overlapped the pine branches. The coloring is so pretty! :) Thank you for sharing. What lovely cards! 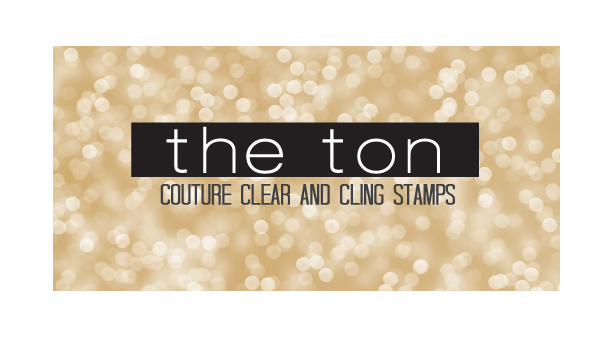 I particularly like the beautiful colours and clean, elegant look of your first card - fabulous! Such an elegant CAS card with a fun shaker element and the bird ornament is another fun card with very pretty colours! Lovely cards. Love the die for the shaker card! Love the shaker card! Both cards are beautiful. Your Peace card is simply beautiful! And I love the pine branch die on the second card. That is a must have!! Absolutely stunning! Both cards! I love the bird ornament and the die cut one also. Thanks for sharing. Your shaker card is just gorgeous! Love the colors as they are perfect for Christmas and winter. Your second card is beautiful, love the addition of the branches to frame the image. Your two cards are beautiful. I especially like the blue ornament because that shade of blue is gorgeous! Lovely cards! That ornament die is so pretty!! Just amazing cards. Love them.. That ornament in blue/shaker is just beautiful! Beautiful cards. I especially love the pine branch and bird ornament one. Love the cards! Great shaker! Beautiful cards!! I love shaker cards and it is gorgeous, then I scrolled down and saw the next one wow, it is gorgeous too! Gorgeous cards! The shaker card is clean and elegant and the bird ornament is so cute! What an elegance you display with your work! Wonderful. That first card is just stunning! That ornament die...drool. 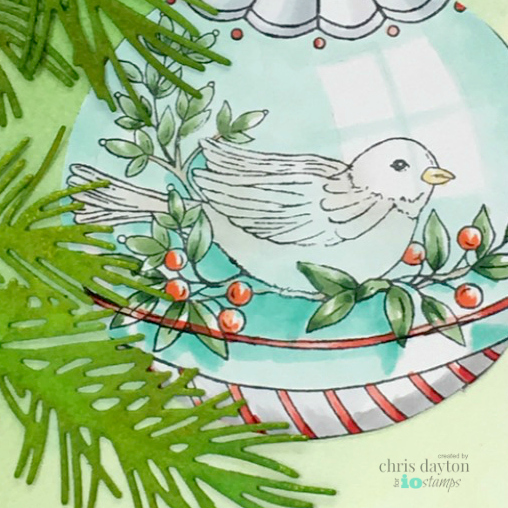 I love the dove ornament stamp, it's great paired with the wonderful pine branch die. Your shaker card is stunning! So pretty! Your coloring on your ornament card is wonderful! I love your color choices! Beautiful cards! I especially love the first one, lovely sparkly and so CAS. Both cards are lovely! I'm smitten with your shaker card. The blue really makes the ornament pop. Both of these cards are first class. Really love the coloring on the ornament! Truly lovely cards, especially the gorgeous shaker card!